Looking for somewhere to tune in for information, ideas or your favorite music? Here in Toronto we can pick up a lot of great signals—so many that it can be hard to find one that's right for you. 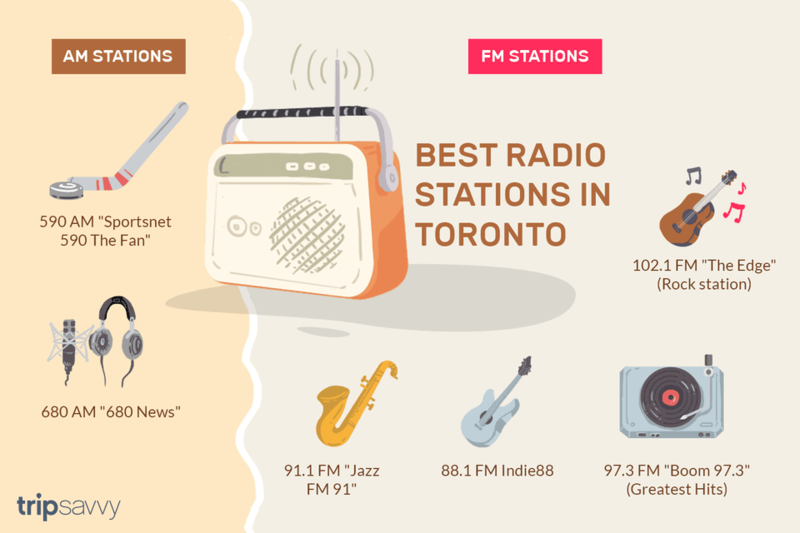 If you're searching for a new radio station, here are a few of Toronto's best radio stations to get you started. Remember, too that visiting the station's website will not only let you listen online, but most also have extra material in the form of blogs, news items, archived shows, podcasts, host bios and more. Many radio station hosts also have their own podcasts. The Fan broadcasts full games from the Jays, Raptors, TFC, and Argos and has plenty of lively discussion and opinion on what's happening in the world of sports. Beyond the obvious pro sports, they also have weekly shows dedicated to golf, mixed martial arts, motorsports and more. 680 is a great go-to for quick information. At most, you'll only ever have to wait ten minutes for the next traffic and weather update or half an hour for sports or business reports. And of course, up-to-date news items fill in the rest of the time. Newstalk 1010 is a hub of discussion on current events, politics, and lifestyle topics. The call-in format is fun and exciting, but it's the hosts who really set the tone. You'll likely discover there are hosts you love and hosts you can't stand. Regular news, traffic and weather updates occur throughout every hour. Long the home of the top-40s-then-oldies 1050 CHUM, 1050 is now the home to all your sports radio needs. Listen to sports analysis shows and podcasts as well as live games, and get all of the info you need on all of your favourite Toronto sports teams. Jazz FM fills the each weekday with pure jazz from 10 am to 2 pm, only getting into traffic and news in the early morning and late afternoons. Evenings and weekends get more specialized, making Jazz FM a great choice for both dedicated jazz lovers and casual listeners seeking a nice workday alternative. Previously known as Kiss 92 FM, this station spent several years as the more rock heavy JACK FM before reverting to the Kiss branding in 2009. Now KiSS 92.5 plays current hits, including a lot of R&B and pop. Indie88 launched in August of 2013 as Canada’s first Indie station. They play a good mix of both established and up-and-coming indie bands. The Move plays a variety of throwback songs from the 1980s, 1990s and 2000s as well as some of the city's hottest songs. Classical, Jazz, Folk, World, R&B, etc. Once a predominantly classical station, CBC Radio 2 broadened its mandate in September 2008 to provide different mixes of genres at different points throughout the day. Formerly playing soft rock and adult contemporary as EZ Rock 97.3, this station switched formats in 2009 and now offers greatest hits targeted to an adult audience, featuring music from the 70s, 80s and 90s. CBC explores Canada as a place, a people, and a culture. Radio One is also a good source for world issues and big ideas and is a last bastion for radio drama. The Edge is arguably slightly less edgier than it was in its early days, but it still plays some great music. CHUM FM is a true variety station. Turn them on for an afternoon to see what's on, or use the website to find a theme show that works for you. Some DJs take an in-depth look at decades, albums or artists while others mix it up with classic rock hits.